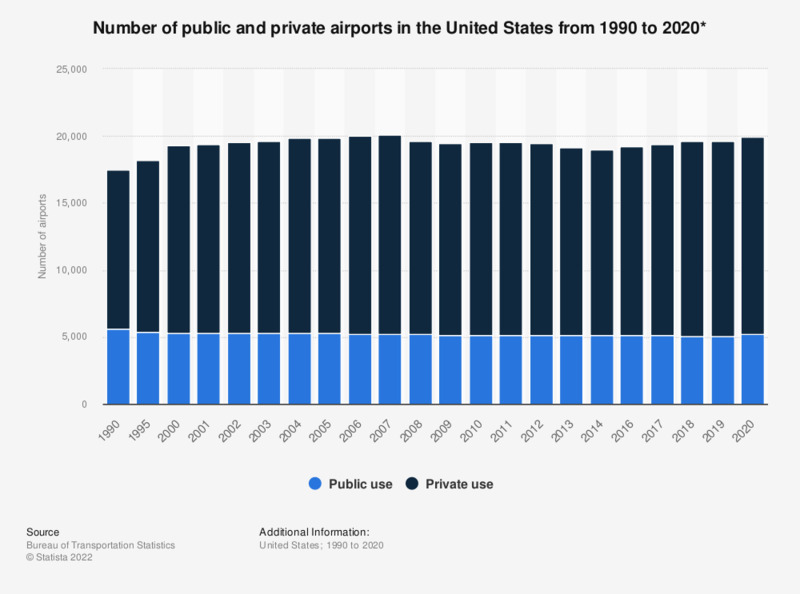 While the number of public use airports in the United States has fallen since 1990, the number of private use airports has increased in recent years. In 2017, there were 5,104 public airports in the U.S., a slight decrease from the 5,145 public airports operating in 2014. Conversely, the number of private airports increased over this period from 13,863 to 14,263. The distinction between public and private use airports refers to usage, not ownership. A public use airport is defined by the FAA as ‘an airport available for use by the general public without a requirement for prior approval of the airport owner or operator’, whereas prior approval is required for private use airports. Included here under the term airport are also heliports, seaplane bases, and facilities for other aerial hobbies. The last decade has seen consistent increases in the number of domestic passengers carried by major U.S. airlines, the number of international passengers travelling to and from the U.S., and the overall number of passenger-miles flown. It may therefore seem strange that the number of public use airports has decreased. This change can likely be explained, at least in part, by the significant decline in the number of regional flights over this period. Includes civil and joint-use civil-military airports, heliports, STOL (short takeoff and landing) ports, and seaplane bases in the United States and its territories. Sole-use military airports are not included.